Cover art of the year? 2014 has been an excellent year, there's no doubt about that. Riot gave us a very Reale-esque record despite losing the man to Crohn's disease almost three years ago, and Morbus Chron, Benighted, and others dropped masterpieces that may take high honors on best-of lists (or at least this one!) all across the metal blogosphere. But one release, lurking quietly in the shadows and from a veteran band no less, is positioned to join them--Sodom's Sacred Warpath. At a glance, the EP isn't impressive. One new track surfaces in the roster, with three live cuts taken from their most recent tour following suit. 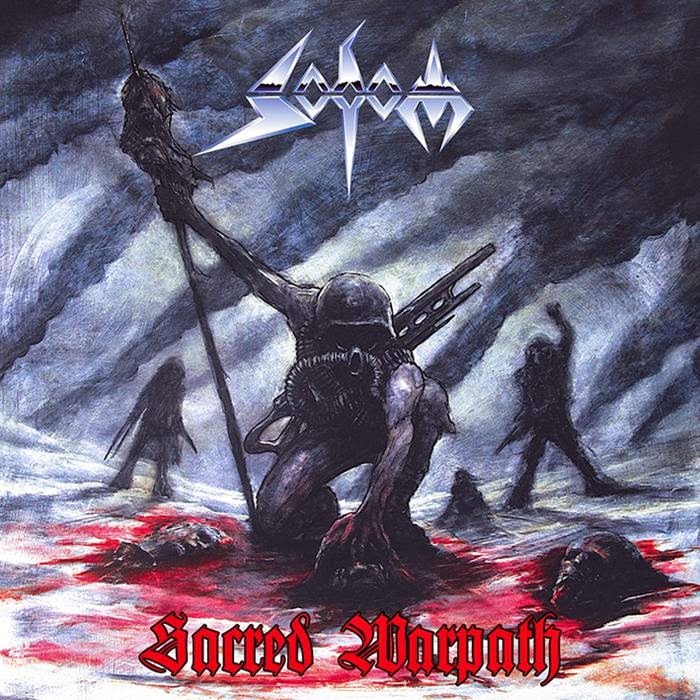 But a closer look reveals a treat: Sodom appears to have captured a piece of their past with the new material and discarded a portion of the melodic mysticism found on their latest full-length, Epitome of Torture. As a song, "Sacred Warpath" feels relatively raw--Angelripper is once again at the top of his game sounding his raspiest in ages, and the instrumental aspect of the track is charged and ready to go at nearly six minutes long, which is something that can't be said of much of the disjointed Epitome of Torture. The production is more primitive, in fact--unpolished guitars and a snare that echoes triumphantly against the studio's wall--but by no means is it akin to classic material. Modern recording equipment just wouldn't allow it, unless done deliberately. With all that said, "Sacred Warpath" isn't entirely devoid of melody (and that's not to say Sodom has EVER been entirely devoid of melody.). While it's a step closer to earlier material, it still has one foot in the modern era and another in the past. In the end, it's just the right mix for modern day Sodom and a marked improvement at that. As for the live tracks? Forget 'em. They're a nice bonus and well played, but they're not the centerpiece here. "Sacred Warpath" is, and it signals a bright future of new releases for this veteran band.